It is still one of the most divisive and most talked about artistic works of modern times. In fact, it is possibly one of the most important cultural, economic and artistic works of ALL time – yes, I really believe that. Am I biased because I love the various works across a host of fields by Cauty and Drummond? Possibly – but let me be clear, my statement regarding the importance of the work does not mean that I necessarily agree with the act itself. However, when you see how the burning of a million quid affects people, it is always a valuable insight. Why? Because the extremity of what the K Foundation did elicits deep values within all of us. The way we think about money shapes our lives and decisions everyday – and therefore, you cannot help but have a strong opinion on this topic. So when I saw that Day 1 of this extravaganza would feature a public hearing, exactly 23 years after the contract of silence was taken and the moratorium had thus expired, to finally discover why exactly the K Foundation removed paper currency from circulation with the aide of a match, I had to attend. The venue for this eagerly anticipated (yes – a genuine usage of that term) debate-of-sorts is The Black-E on George St, Liverpool – a fantastically grand building and an ideal setting for this lavish concept. As we arrive, the entrance has something familiar within it, the T-shaped speaker stack that had appeared at News From Nowhere for the book launch earlier. Premium photo opportunity material right there. The five panellists give short presentations with their reasoning. Jeremy Deller (artist): Seemed to initially see the act as an artistic statement whilst also exploring how The KLF may have got to a point of wanting to disassociate with what dance music had become (a slide showing Norman Cook was used to exemplify this point). Anebella Pollen (art historian, author of ‘The Kindred of the Kibbo Kift: Intellectual Barbarians’): Anebella drew hefty comparisons and found many similarities between our artists and the English camping and hiking organisation known as the Kibbo Kift. This was very much based around mythology and instantly won support in the audience. Tom Hodgkinson (editor, Idler ): Tom spoke extensively of his friendship of Bill over the years and reagaled us with tales of their past and informed on what he saw in the character of Drummond that caused them to make the decision. Ann Pettifor (economist): This was quite a different approach to all the other panellists as Ann interestingly explained an economic viewpoint on money that led to her conclusion that The K Foundation wanted to relieve The Bank Of England of the responsibility of having to honour their commitment to the sum of money. Clive Martin (journalist, Vice): Clive believed that our protagonists foresaw that money would become of less value in society and hence preempted it via the burning ritual. 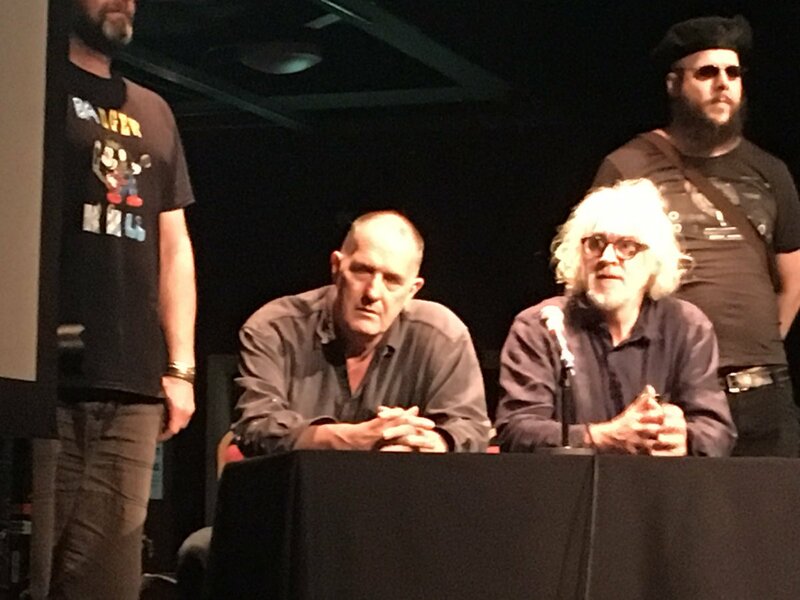 Jim Reid (journalist, present at the burning): Jim discussed the characters of the pair in part and had the hall in stitches when he described them as ‘geniuses with a Dad’s Army sense’. Similarly to Gimpo, the event did not distress him too much. However, he was shocked at how little press the story got in the days after and he felt that many believed it to be a hoax. Chris Brook (author, The K Foundation Burn A Million Quid): Before I get started, if you have not read Chris’ book around this event, you should check it out – it is a fantastic read. Having Chris in attendance was of real intrigue for myself and someone with a lot of value. His account gave insight into the tour of the filming of the burning and the reactions that the screenings brought about. Angie Sammons (attendee, Liverpool screening / writer, Daily Post, Liverpool + 3 associates): Basically, it turns out that this screening was perceived as antagonistic, and as it was screened late to a ‘merry’ crowd, it was not received well. At this point, some interesting points arose about how The K Foundation were never fully accepted within the art world as they were not part of the in-crowd. Ann Pettifor also described a shift in the art world and referenced Damon Hirst’s ‘For the Love of God’ (Diamond Skull) as a creation for the sole purpose of being used as collateral rather than art being created for art’s sake. This resonated hugely with the attendees. Craig McClane (reporter): This was quite a crazy account from the opening disastrous day of the tour to the point that Bill and Jimmy signed the infamous moratorium contract (car pushed over a cliff). John Higgs (author, The KLF: Chaos, Magic and the Band who Burned a Million Pounds): If you haven’t read this book, open a second browser window right now and do yourself a favour and grab it – essential (just like Chris’ book). John has become a highly respected figure in The KLF community in recent years. He actually put forward the notion that the ‘Why?’ question is not the one of interest anymore. Of real significance was John’s allusion to Reality Tunnels (a term coined by Timothy Leary and then further expanded on by Robert Anton Wilson) – and this event is the type that throws such a spanner into ours that we have to explore it. Furthermore, he used a Robert Anton Wilson reference regarding how their can be combinations of truths and falsehoods in parallel at the same time. Questioning the significance of ‘Why?’ was quite revelatory as this was not the aim of this forum. At what was verging on a three hour session, John’s closing remarks changed the mood (he was finding agreement) of what was starting to become a restless atmosphere. Tom James then explained the voting process. Buckets would be used to represent each case by number, and in order to vote, you needed to place your £1 coin that you had been given on entry in the bucket of your choice. £367 had been given out. In order for a winner to be found there had to be a majority of 23% (£85) or more otherwise we would embark on another 23 year moratorium. The voting was a joke. There was no proper or efficient system in place and people were almost sprawling over each other to get to buckets as clearly there was not going to be a pass around of each bucket across every volunteer. The coins were counted, a clear winner – Bucket 2, Annebella Pollen who summised that The K Foundation burnt a million quid due to a ‘deep historical tradition of weirdness’. The JAMs were then called in and presented with their reason. It was clear that Annebella would win. Personally, I am not sure that her argument was the closest reason, if anything Jeremy Deller’s inital opener felt more inline for me. However, part of the reason she won was because she was so well prepared (most significant visual slide deck) and she tapped into something the fans will find attractive – the mythological aspect. In comparison, the other panellists did vary in quality of delivery and possibly their preparation too. And when some of the closing reasons did not then correlate with their opening statements, it only confused matters further. This may have all just been a bit of fun. But this was a significant artistic act no matter what your moral take on the subject matter. To conclude that it was just weirdness is not satisfactory, accurate or doing justice to the work. Fuuk the eschaton. Badger Kull tuberculosis. I know why. but remember the central catma. All affirmations are true in some sense, false in some sense, meaningless in some sense, true and false in some sense, true and meaningless in some sense, false and meaningless in some sense, and true and false and meaningless in some sense. there are 23 clues. zonkey is one.